§ 15. 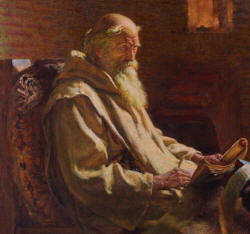 AFTER the death of Boisil, Cuthbert took upon himself the duties of the office before mentioned; and for many years discharged them with the most pious zeal, as became a saint: for he not only furnished both precept and example to his brethren of the monastery, but sought to lead the minds of the neighbouring people to the love of heavenly things. Many of them, indeed, disgraced the faith which they professed, by unholy deeds; and some of them, in the time of mortality, neglecting the sacrament of their creed, had recourse to idolatrous remedies, as if by charms or amulets, or any other mysteries of the magical art, they were able to avert a stroke inflicted upon them by the Lord. To correct these errors, he often went out from the monastery, sometimes on horseback, sometimes on foot, and preached the way of truth to the neighbouring villages, as Boisil, his predecessor, had done before him. It was at this time customary for the English people to flock together when a clerk or priest entered a village, and listen to what he said, that so they might learn something from him, and amend their lives. Now Cuthbert was so skilful in teaching, and so zealous in what he undertook, that none dared to conceal from him their thoughts, but all acknowledged what they had done amiss; for they supposed that it was impossible to escape his notice, and they hoped to merit forgiveness by an honest confession. He was mostly accustomed to travel to those villages which lay in out of the way places among the mountains, which by their poverty and natural horrors deterred other visiters. Yet even here did his devoted mind find exercise for his powers of teaching, insomuch that he often remained a week, sometimes two or three, nay, even a whole month, without returning home; but dwelling among the mountains, taught the poor people, both by the words of his preaching, and also by his own holy conduct.